Another year, another decision as what to have as my main meal on Christmas day. It’s something I make myself, so as to not add more pressure on my mum who makes all the rest of the food at Christmas. She really does not get enough credit for all the food she makes for the Christmas Eve & Day main meals and any more we may have if family visit on another day. So thank you, mum. I hope my small effort in making my veggie meal helped! It turned out to be a bit of a monster!! Huge! Although the recipe said it served 8 so it is not surprising it was this large. One thing I discovered in making this is to use cooked chestnuts – the ones you can get vac-packed or in tins. We tried using fresh ones & roasted them before peeling. Nightmare!!! It took so long and really was not worth the effort. Lesson learned! 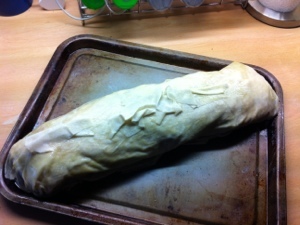 Here is a pic of it cooked, although I didn’t get a great one of the insides. 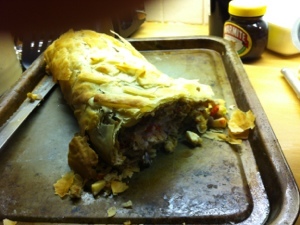 This entry was posted in Main dish, Vegetarian and tagged artichoke, chestnuts, Christmas, leeks, Morrisons, pastry. Bookmark the permalink.